We stand at the brink of a precipice. Just nine or 10 plants species feed the world and signs are here that they have peaked in production. By and large, the majority of the population has deluded themselves into believing a bright future is upon the horizon. For years, economic forecasters and preppers alike have warned of the bottom dropping out of the economy. The proverbial doom prediction of “it’s not if, but when” is not just a phrase to add dramatic effect, it is a call to action. It’s a warning that the American dream is about to drastically change and that it is time to prepare accordingly. We have all seen the anomalous increase in food prices. We can blame it on the massive droughts, extreme weather patterns, and increased cost-of-living that has occurred over several years. While these factors certainly play into the equation, experts believe the root cause is that the world has entered into an era of “peak food” production. Peak production refers to a point at which the growth in production of a crop, animal or other foodstuff begins to slow down. Nine or ten food staples feed the world and they are slowing in their production. New research finds that the supply of 21 staples, such as eggs, meat, vegetables and soybeans is already growing scarce, while the global population continues to soar. Peak chicken production was in 2006, while milk and wheat both peaked in 2004 and rice peaked way back in 1988, according to new research from Yale University, Michigan State University and the Helmholtz Centre for Environmental Research in Germany. What makes the report particularly alarming is that so many crucial sources of food have peaked in a relatively short period of history, the researchers said. “People often talk of substitution. If we run out of one substance we just substitute another. But if multiple resources are running out, we’ve got a problem. Mankind needs to accept that renewable raw materials are reaching their yield limits worldwide,” said Jianguo “Jack” Liu, of Michigan State University. This synchronization of peak years is all the more worrying because it suggests the whole food system is becoming overwhelmed, making it extremely difficult to resurrect the fortunes of any one foodstuff, let alone all of them, the report suggested. Certainly we can just substitute foods before the production begins to plateau and decrease. See the complete list of peak foods here. Many believe this simultaneous peaking of the world’s basic foodstuffs is largely due to the massive population boom (world population is expected to reach nine billion by 2050), which is placing an ever-greater strain on the land for housing, agriculture, business and infrastructure. Quite simply, the demand is greater than the supply. The World Bank warned of this years ago and it continues to be a issue. As we continue down this unsustainable path, prices in food and other goods will only continue to climb, leaving many without the wherewithal to invest in healthy food choices for their family. Eating cheaper, less nutritious food will have catastrophic life-long effects on the social, physical, and mental wellbeing of millions of young people. We are already seeing this today. According to the last Census report, one out every five children is on food stamps – that’s more than before the recession. This is how many believe the powers that be will bleed the upper and middle class dry. Mac Slavo notes just how serious things have gotten for the middle class. 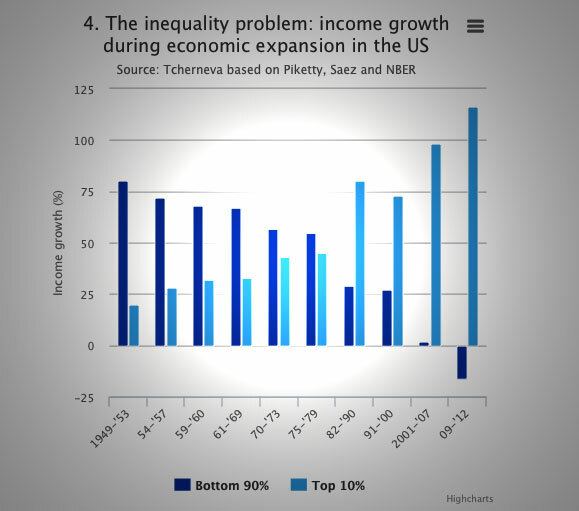 This chart, published by the London Telegraph, shows what has happened to Americans as they struggled to tread water and keep afloat after 2008. For the United States, there have been some signs of improvement, but mostly for those already on top. And the general decline in the global rankings of economic freedom and civil liberties does not complement the widening inequality, either. Moreover, in a recent article written by Michael Snyder of the Economic Collapse Blog, he cautions that the collapse in oil will also play a leading role in the destruction of our economy. The key to how much damage this oil collapse is going to do to our economy is not how low prices ultimately go. Rather, the key is how long they stay at these low levels. If the price of oil went back to $80 a barrel next week, the damage would be fairly minimal. But if the price of oil stays at this current level for the remainder of 2015, the damage will be absolutely catastrophic. Folks, this is the time that we have all been preparing for. The near future will be the moment your preparedness endeavors will pay off. Essentially, this undertaking will become your lifeline. Now is the time to double down on your preparedness efforts. It’s time we accept that we have reached an era of total unpredictability. Clearly there are changes that are necessary in order to slow this impending fate. One simple change we can all make is to consume the food we purchase. Roughly 30 to 40 per cent of the food grown globally for human consumption never gets eaten. Eliminating waste would go a long way to feeding the growing population. Another way to circumvent this inevitability is to begin limiting our dependence on grocery stores. Growing or raising your own food sources, learning skills to live self-reliantly, and bartering for goods and services will help you become more in tune with what your family needs to survive the food plateaus in the coming years. As well, consider these other suggestions for limiting your exposure to this potential game changer. Get prepared. Buying food, products, and supplies in bulk will help you prepare for price inflation. If you have the means to do so, buy 30-60 days’ worth so that you have everything you need. Having these on hand will help you if times become more difficult. You can use this free online series to begin creating a personal step-by-step preparedness plan for your family; or, buy the best-selling book, The Prepper’s Blueprint to use as a reference in your preparations. Preserve wealth.Choose hard assets (dry goods, precious metals, land, livestock, skills, etc.) for long-term investments so they will hold their intrinsic value over time. Holding these types of investments will insulate you from inflation and other economic issues. Further, tying your money up in assets will help you avoid the inflating prices of food sources in the future, thus furthering your cause of self-reliant living. Invest in food.If we are at our peak for certain foods, now is the time to store them for future use. Further, these foods last a lifetime and would make sound investments for future planning. Ironically, many of these are in the peak foods list. Ideally, you want to store shelf-stable foods that your family normally consumes, as well as find foods that are multi-dynamic and serve many purposes. Dry goods like rice, wheat, beans, salt, honey, and dry milk will provide you with an investment that will grow in value as prices rise, and also offer you peace of mind in case the economy further degrades. How much food should you store? The Ready Nutrition food storage calculator can help you to determine how much inventory you may need and allows you to break your purchases into weekly shopping trips so you don’t have to invest thousands of dollars up front. As well, read Emergency Items: What Will Disappear First for more ideas. Invest in an emergency pantry. Did you know that nearly 23% of your grocery bill is spent on processed foods and sweets? 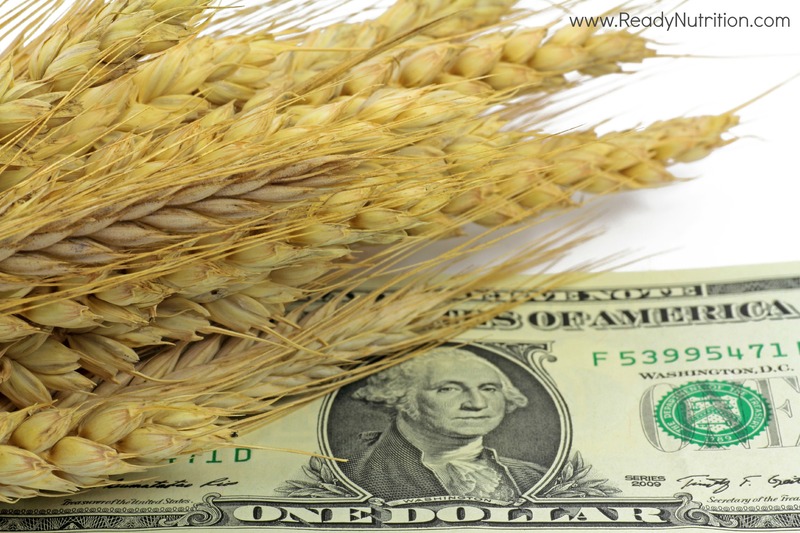 Rather than spending it on GMO filled junk, you can use that money to invest in a food pantry. One of the best decisions my family made into our future livelihood was to eliminate our debt by simplifying our lifestyle, and by creating a food pantry based on the 25 most popular pantry goods. Learn how to grow your own food. In a homestead environment, a person wants the land to work for them as much as possible. Invest in fruit trees, seeds, and garden supplies. If you really want these peak foods, find a way to grow them yourself. Further, if you live in a rural area, consider investing in trees and bushes that will lure wild game. The trees and bushes can provide you with added sustenance and help you stock meat in your freezer. Here is a how-to guide for creating a garden quickly. Raise livestock. Rather than paying hard-earned money at the store for eggs, poultry and dairy—raise them yourself. Chickens are very easy to care for and can provide you with meat and eggs throughout the year. Additionally, you can find substitutions for these peak foods with a little research and ingenuity. For example, rabbits would be a suitable protein replacement. Similar to chickens, they don’t require much care and with some effort can be fed from the homestead’s garden or you can grow fodder. They are also great breeders and will provide you with ample amounts of meat. These are the 10 best meat rabbit breeds. As well, for the modest price of purchasing a fishing license, you can stock your freezer with fresh-caught fish. It all adds up. Pay off debts ahead of time and work to restructure your outgoing funds to lower your expenses as much as possible. Any money that is saved, set it aside. That way, if your personal income dries up, you won’t have to go into default. Simplify your lifestyle. Before you begin investing, take steps to get out of debt. Debt only enslaves you further, and simplifying your lifestyle can help break those shackles. Learn about these 6 ways to simplify your lifestyle. We stand at the brink of a precipice and the choice is yours to make. Most emergencies don’t unfold slowly; unlike earthquakes or other natural disasters, we have had the benefit and the curse of watching the food crisis gradually come to light. What you choose to do with this information is critical and apathy doesn’t change the fact that immense, potentially life-threatening changes are on the way. Sooner or later our essential crops will stop producing and lifelines need to be in place. Those who are prepared are not only acting in the best interest of their families, but of society as a whole. The investments we make today will be consumed and used tomorrow—we’ve been given fair warning and now is the time to rise to the occasion. I live off grid but on the road system in rural Alaska. Since it is 200+ miles to large town shopping we have always kept a pantry. We raise a garden and have found ways to grow canning quantities of things like green beans, tomatoes and cucumbers. If resupply became impossible potatoes are our fall back crop for survival allong with hunting and fishing. I don’t really buy the idea of peak food. Aside from the huge waste you mentioned we are devoting huge acerages to growing corn for fuel and to produce unhealthy sugars. If land has a long enough season and sufficient water to grow industrial corn it can produce many other crops for direct consumption. If more people grew even a small garden and were willing to eat seasonal foods and storage crops in stead of expecting fresf strawberries etc.in December people in southern third world countries could feed their people instead of exporting luxury foods to the north. Peak oil was a big deal a few years ago and now we have a glut that risks taking down the worlds financial system. Why are we using corn to make ethanol which is a second rate fuel besides. I certainly agree with your ideas for dealing with the likelyhood of rising prices and economic decline. We have been implementing most of them long before we ever herd the term “prepper”. Good article with food for thought. No pun intended…Really! I don’t believe in “peek food” production. They said we reached “peak Oil” years ago and now know that was BS. In school in the 50s they were telling us that the world would run out of oil by the year 2000. If we run out of food it will not be because we cant grow enough.